Cross the Sky Ministry is reaching out to people around the world! We’ve seen our resources used in China, South Africa, India, Pakistan, Canada, Australia, Haiti, the Bahamas, Switzerland, and the United Kingdom. PDF Files are available via email. See menus below for choices. We can ship materials to Australia, South Africa, New Zealand, Canada, and the U.K. Shipping is estimated at 6 to 10 business days via priority mail. See fees below. Credit card payment is required via PayPal. If not a PayPal member you can still sign in as a guest and use your credit card. Skits With A Message is available as a PDF File (sent via email) or as a Book (priority mail). 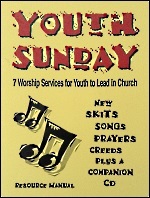 Also available via priority shipping are the Youth Sunday CD, Songbook, or Complete Package. Shipping is $15 per item, or $15 for the Complete Package. Shout It Out is available as a PDF File (sent via email) or as a Resource Book (priority shipping). Also available via priority shipping are the Shout It Out CD, Songbook, or Complete Package. 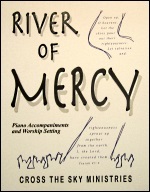 River of Mercy is only available by mail for overseas orders. Items include River of Mercy CD, Songbook, or Complete Package. A mime drama about Jesus Christ, His life, and ministry! Resources include the Director’s Booklet, CD, DVD, or Complete Package.